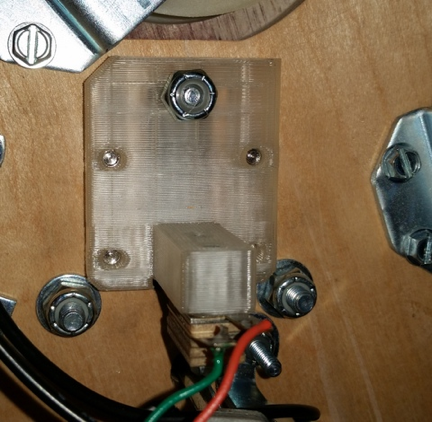 2 machine screws 6-32 x 3/4"
4 Machine screws 6-32 x 1/2"
Unmount the Wolverine from the bash bracket by undoing the four screws under the playfield. 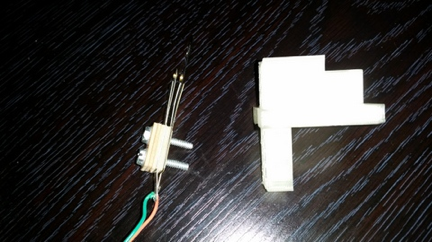 Unplug the molex connector. Pull him up and out. 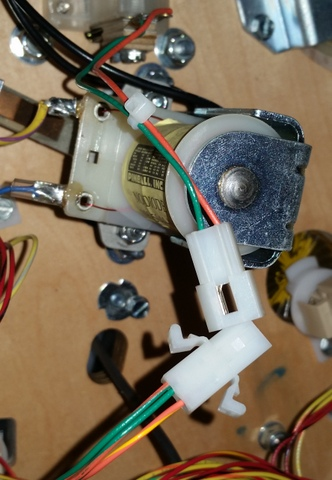 Note: LE owners may need to desolder black wire to light Wolverine in order to remove him from the playfield. You will be left with an open slot as seen in images below. 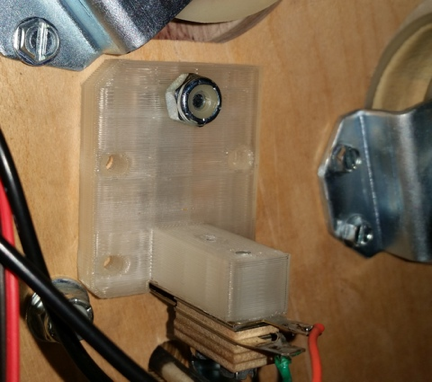 Mount the switch that was previously part of the bash assembly to the bracket using two machine screws (part #237-5976-05). 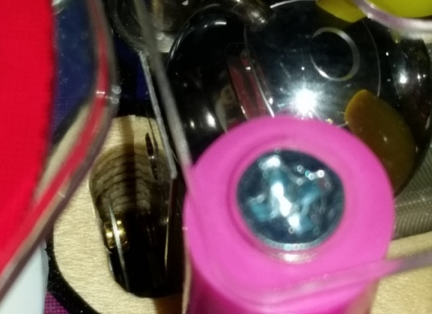 Spacing on the switch is up to the owner, but keep in mind that if you set it too close, the pop bumper could trigger it and if you set it too far, it may not register hits. 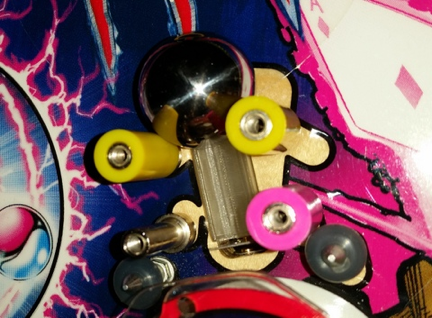 Feed the bracket up through the playfield. 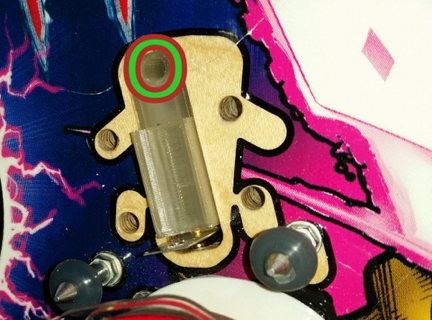 View from above the playfield with the spot where the Newton ball is inserted identified by the green and red circle. From the bottom of the playfied attach the bracket with the nylon nut (part #4410-01132-00). 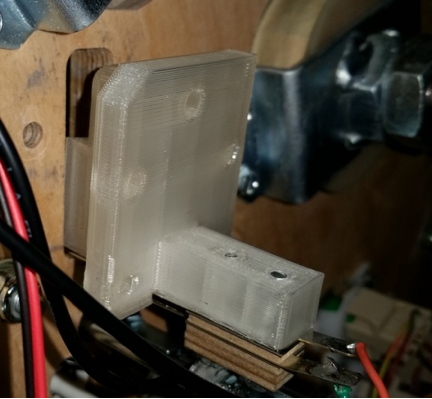 Tighten it down while holding the ball above the playfield, but leave wiggle room for the bracket to have some horizontal movement as you will be adding four posts above the playfield and need to align the holes. 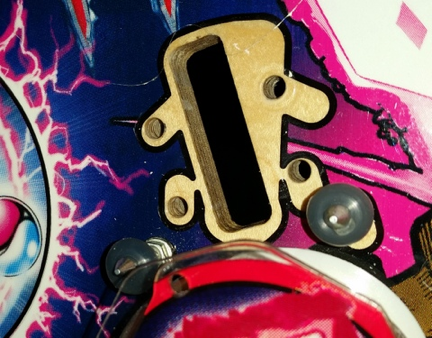 With the playfield lifted, start adding posts (part #02-4036-1 from Marcos Specialties only) and hand tighten them into the bracket to confirm alignment and begin the threading process. Add black rubbers (included with kit) or buy Cliffy rubbers for the posts. These will look nice and add some color to the area. 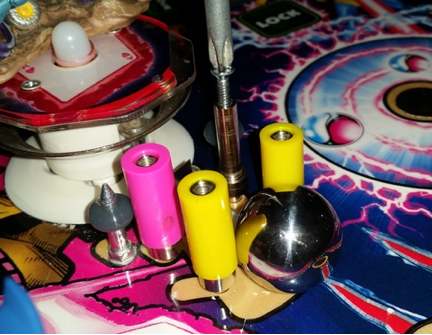 Please note that the back right post should not have a rubber as the space is needed for the second ball to strike the switch. 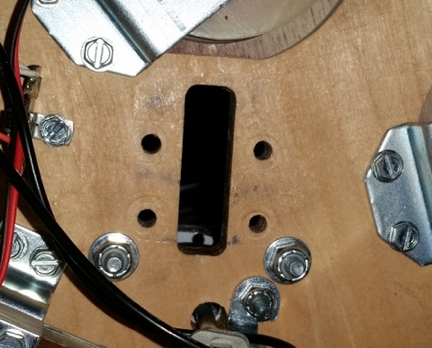 Place the ball bearing in between the four posts, on top of the bracket. Add the Newton plastic cover (included) or a lexan plastic cover (not included) to the top of the posts and secure them with machine screws (6-32 x 1/2”). Note, you do not need this cover, but it gives the option to mount a figure above it. Here is an example of the gap on the switch. Remember this varies based on player preference. 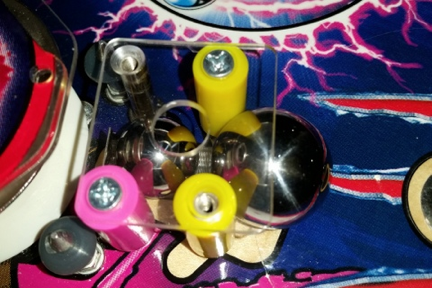 Secure the #10 nylon nut to the bracket tightly, holding the ball to prevent spinning above the playfield. Reconnect the switch and installation is complete. Here is a photo of the newton bracket installed with a Wolverine over the top. Look at that beast shot! 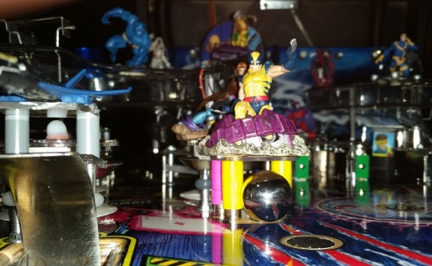 It makes the Wolverine much harder to hit and forces you to hit the ball if you want to hit him. Careful of that magnet!